A Pit Colliery, Newcastle, 24 February 1899. From the Ralph Snowball/Norm Barney Collection, University of Newcastle, Cultural Collections. 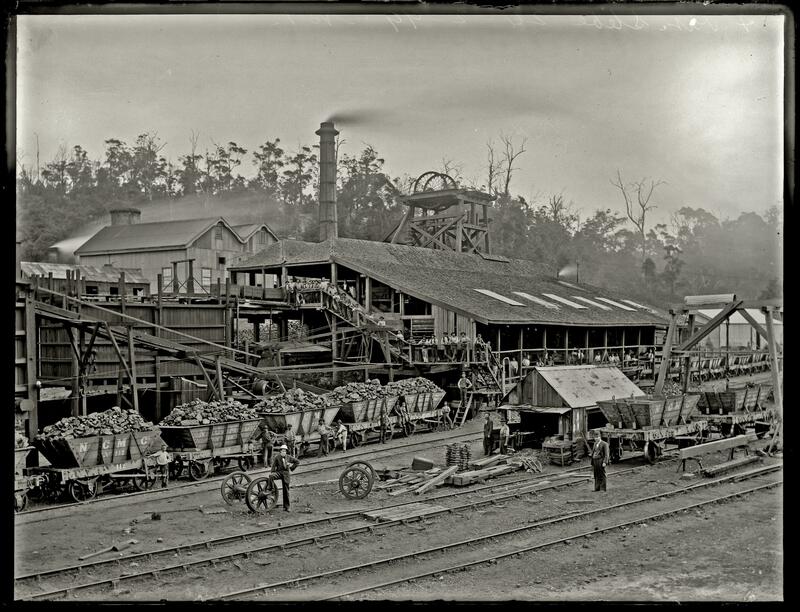 The first mines in the Hunter Valley were developed without the benefit of government transport infrastructure such as roads and railways. They were therefore, obligated to build their own rail lines to get the coal to Newcastle Harbour to be shipped. For many mines that were not close to Newcastle, the expense of transport by road was enormous. Mines that endeavored to transport coal with teams of oxen and carts found the process incredibly slow and nearly impossible. To keep a competitive edge, many mines built their own railways, buying their own coal carts and engines. Mines even offered passenger service, especially for mine workers going to and from work. Private railways could be used by one company, however some were used by many as a common carrier service. Once the Great Northern Railway was built, many private rails connected to this public line. Today coal companies still use a combination of private and public rails to transport coal.